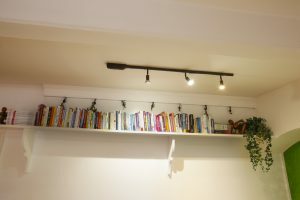 Do you fancy being located at the N’Office? 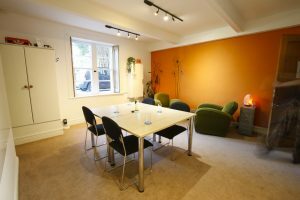 Paula and I would like infuse the N’Office with some extra living energy (we are currently very location independent, causing the space to feel underutilised) so we are extending an invitation for two likeminded individuals to share the N’Office with us! Ideal if you need a space for a MAX of 10 hours a week, but don’t want to pay for rooms by the hour. 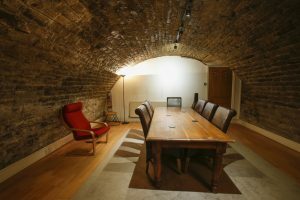 Perfect for a coach, consultant, talking therapist or similar, requiring somewhere professional and discreet to meet with clients and prospective clients. 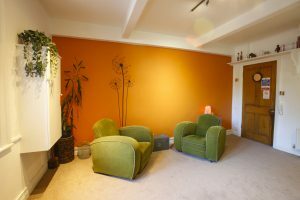 Located in the basement of a stunning Victorian listed building on New North Road in Huddersfield with a HD1 Postcode, easy access from the M62 and 10-15minutes walk from the train station. 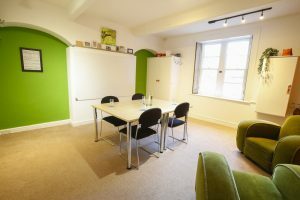 We have a welcoming workspace, with a couple of famously deep and comfy armchairs, a meeting table with 4 chairs, a white board and projector, WIFI and a bookshelf full of personal development books! 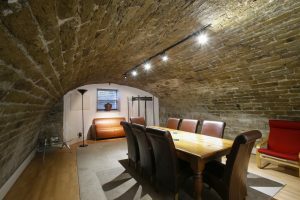 There is also access to a beautiful vaulted cellar “boardroom” that can seat 8 round the solid oak table or 10-15 comfortably theatre style for presentations. Great if you want to run workshops or seminars without carrying the risk of a 3rd party venue. The space is accessible on evenings and weekends. On the same floor there are kitchen facilities and a toilet, so it really is a self contained suite. There is a small number of on-site parking spaces offered on a first come first served basis and free on street parking. This is a basement room so unfortunately there is no accessibility catered for. Send me a message if you are interested in joining our space or please share with anyone you know this may suit! Previous post The KOKO Sessions Next post How to choose Joy!